Acura created one of the finest entry-level sport sedans with its TSX a few years back, but now introduces another winner to slot in just under the TSX. For 2013 Acura rolls out the ever so slightly smaller ILX to fill the entry slot as TSX has crept up to a $31,010 base price. The new ILX wedges in at a more approachable $25,900, yet is only about 6 inches shorter overall and rides on just a 1.4-inch shorter wheelbase. In reality, this is the size that cars like the Honda Accord, Toyota Camry and Mazda 626 used to occupy before the Japanese car makers grew them to fit U.S. mid-market appetites. ILX seems perfectly sized and priced for empty-nesters and young professional couples who want something a little more luxurious, but don’t want to be car poor. First, the ILX is based off the Civic platform, but this is much more refined feeling than any Civic I’ve driven. Yet, in the tested Premium version with a six-speed manual transmission the car feels as racy as smaller BMW’s used to feel before they ate too much schnitzel. 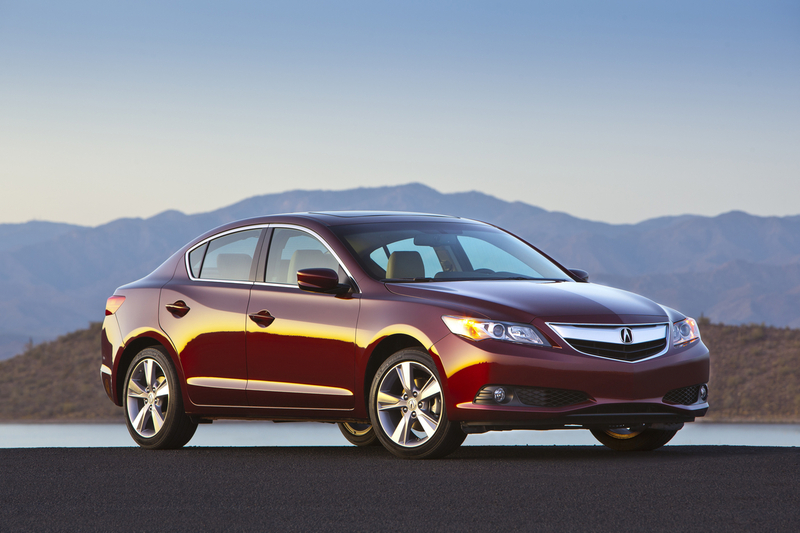 Acura keeps the ILX at 2,879 pounds and delivers both a light but substantial feel, along with fluid steering. The sport sedan features electric power-assisted rack and pinion steering and while the wheel feels light, it doesn’t feel sloppy. The car turns into corners well, but exhibits a little body lean in faster, sharper turns. Still, this isn’t a racer, it’s a car that’s well tuned to our everyday driving needs and lumpy streets. Ride is well controlled and delivers a comfortable feel for passengers. Rough roads are smoothed, but again, there’s a balance between control and comfort with MacPherson struts up front and a multi-link system in back , plus stabilizer bars front and rear. No Germanic punishment to the tooshie here. Here’s the best part though, the engine. 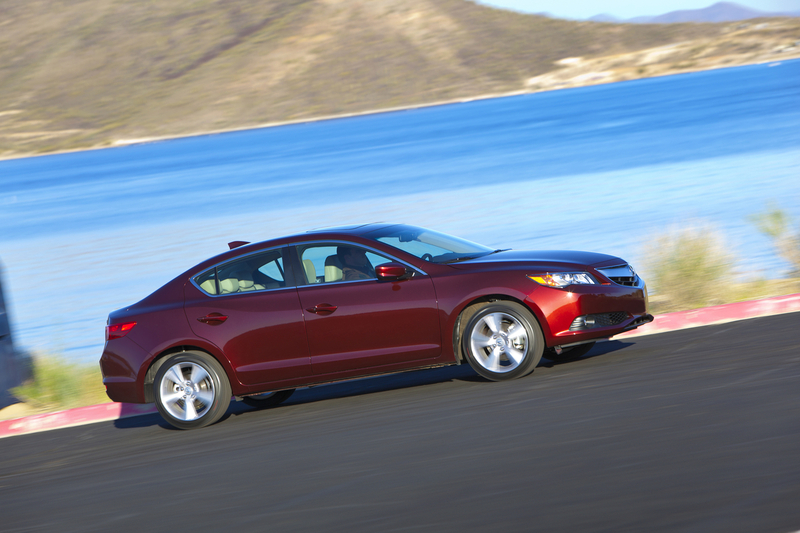 Acura drops the same torque-happy 2.4-liter double-overhead cam 16-valve I4 used in the Civic SI into the ILX. Result? 201 horsepower delivered in quick bursts via a buttery smooth six-speed manual transmission. It has been a while since I drove a sedan with a 6-speed this easy to shift, the short-shifter sliding easily from gear to gear. THIS is what a shifter is supposed to feel like. The fun here is in revving this hummer up and getting going quickly from a stoplight or onto a freeway. Or you can shift early and still get decent gas mileage without suffering for acceleration. I got 27.5 mpg in about 60% city driving and then ran a 90-mile highway stretch and got 34.7 mpg, both better than I would have imagined as the car has an EPA rating of 22 mpg city and 31 highway. The ILX does prefer premium fuel though. Underneath ,the Premium model uses 17-inch tires, while the base model comes with 16-inchers. This also has four-wheel vented disc brakes, plus stability control. Yes, this is a sporty family sedan and to my eye, the best looking Acura at the moment with a more refined chevron-shaped nose than the rest of Acura’s lineup whose noses seem a bit over the top in styling. Inside the car is quiet without being numbingly so. You can hear the engine’s sweet exhaust tone, but still can have an easy conversation in the cockpit. Four adults fit well too with good head and legroom up front. Anyone larger than average might feel a bit less room in back, but I had several riders and they praised the rear seat’s comfort. ILX’s dash and controls are well laid out and easy to use and the interior is subtly stylish. The crimson garnet (metallic red) test car featured a tan over brown leather interior and tan headliner. Dash trim resembles pewter to give the car a ritzy look and the steering wheel and most of the shifter are wrapped in leather. Seats are well shaped with particularly good back side support. The driver’s seat has 8-way power and is easy to get comfortable. Both front seats also have two heating levels. A manual tilt/telescope steering wheel with cruise, radio, phone and trip computer buttons on the hub, also aids driving comfort. The main gauges are easy to see and the center stack’s layout is clean with good-sized buttons and knobs. There is no navigation system on this model and I didn’t miss it at all. No doubt its absence also kept the car’s price down a bit. There’s a dual automatic climate control system that’s easy to use, a big glove box, two cup holders and a large comfortable center armrest and storage box. Overhead is a sunroof and sturdy visors, but they did not slide or have extenders. Yes, I know I comment on this a lot, but it’s a simple thing all cars should have, solely for safety. Speaking of which, visibility is good in the ILX, much better than some larger cars with their giant A pillars. Acura gives the car useful split fold-down rear seats, which could help if you were traveling with a lot of luggage. This is where the ILX comes up short, literally, compared to the TSX. Cargo space here is 12.3 cubic feet vs. 14 in the TSX. Still, the trunk will hold at least 3 suitcases. The test car started at $29,200 and added only a $895 charge to hit $30,095. Sticking with the base model saves you some dough, but you get a 5-speed automatic and only a 150-horse 2.0-liter I4 that will feel decidedly less racy. Gas mileage increases to 24 mpg city and 35 highway though, and premium gas isn’t necessary. 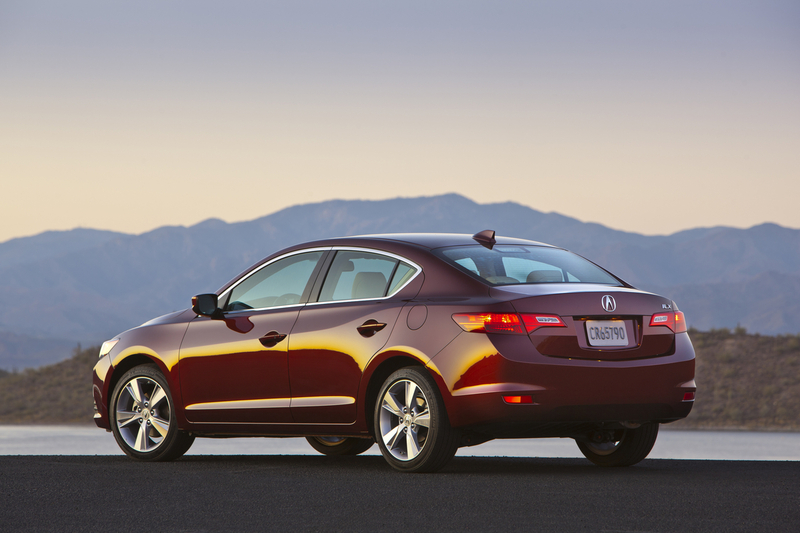 Acura also offers a hybrid model with CVT (Continuously Variable Transmission). It starts at $28,900 and gets 39 mpg city and 38 highway, says the EPA. Tech models, that add navigation and a variety of other electronic goodies push the entry price to between $31,400 and $34,400 for the hybrid version. I’d stick either with the base to save money and still have an attractive, albeit less fun, ride. Or move up to this Premium model for a moderate amount of bells and whistles, yet all the power and comfort you’d ever really need. Hits: Sporty family sedan with excellent acceleration, smooth 6-speed manual, light steering and good ride. Comfy seats for four and well laid out and styled interior, two-speed heated seats, simple controls. Nice styling, nice price and fine mpg too. Misses: Slight body lean in turns and the sun visors do not slide or have extenders.